09:00 a.m. to 12:00 p.m.
11:00 a.m. to 03:30 a.m.
Our name says it all: Pomodoro Pizza Pasta Burritos. This is a unique mix of Italian dishes with Tex-Mex touches. In other words, one of the most unique restaurants in Madrid that you will find. But not only due to the fusion of gastronomy that we create, but also due to the astonishing price that all our dishes have. Unique and cheap. Yes, any dish in Pomodoro Pizza currently costs 3.90 euros. That’s right! Keep on reading to discover the surprises that we have in store for you in our Italian restaurant located in the Manoteras Center. Although we incorporate these tex-mex flavours that come from the other side of the Atlantic Ocean, the truth is that we are a magnificent Italian restaurant in Madrid. A place that immediately transports you to the atmosphere and the decoration of the most authentic trattorias in transalpine cities. Our furniture, tablecloths, ornamentation, etc … everything smells like Italy. Just like in real trattorias, here we also take care of the quality of the products with which we prepare our dishes. This makes us one of the most desirable and cheapest Italian restaurants in Madrid. With our prices we make sure that everyone can enjoy a special dinner. And we even make it a lot easier to spend a great family evening in the Manoteras Center Cinemas & Restaurants. You can also take the opportunity to see some of the latest movies in Cinesa and then have dinner at Pomodoro Pizza. In short, we can say without fear of being wrong that we are one of the cheapest restaurants in Madrid. Pomodoro Pizza Pasta Burritos has become one of the best restaurant experiences in Spain. In fact, we have recently been awarded the 2017/2018 Trade of the Year Award, which is a recognition to all our qualities: excellent value for money, excellent customer service, good selection in our menu, detailed environment and decoration, staff training, variety of discounts, offers and promotions, quality of products, and accessibility and payment facilities. In short, we are one of the best restaurants in Madrid, and even throughout Spain. Pizza, pasta, burritos are by logic on our menu, as our commercial name suggests. But there is much more. We also have hamburgers, baked dishes or salads, in addition to tasty starters and sweet desserts to end your meal. All the essentials for a magnificent meal before entering an afternoon session at the Cinesa Manoteras cinema or for a great dinner after watching that movie that has recently premiered on Madrid’s box-office. Our array of pizzas is undoubtedly the most delicious in the menu. We can practically make any combination that comes to mind. 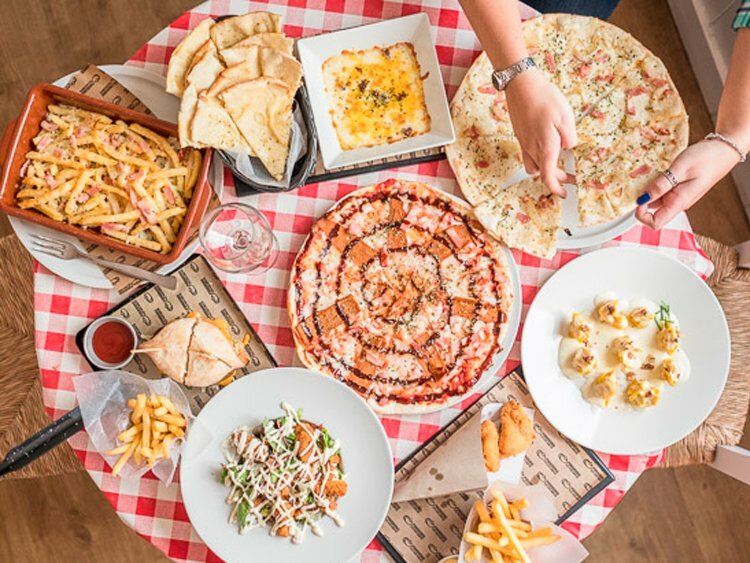 You will of course find the most classic such as Four Cheeses or the Pepreroni pizza, but we also have others with our characteristic tex-mex touch, such as our Barbacoa or Americana pizzas. We also offer some more unique dishes such as Mallorquina with good sobrasada (raw, cured sausage) or kebab in which there will be plenty of yogurt sauce. Try any of them, the price is identical for all, 3.90 euros! An almost ridiculous price, considering that we are one of the best pizzerias in Madrid. We are not just a pizzeria, we are also a good pasta restaurant in Madrid. Here we have great and cheap dry pasta dishes with various sauces. But we also have other fresh pasta dishes and even he classic baked lasagne. And the third pillar of the Pomodoro Pizza menu are our burritos that reminisce the rich and spicy Tex-Mex cuisine. What do you want to fill your burrito with? This is a typical dish from the Mexican state of Tijuana that we also have it at Pomodoro Pizza. If you prefer more Iberian flavours, they are also at your disposal. Always with the quality that characterizes us and with our unique price. Puede cambiar la configuración u obtener más información aquí: Política de Cookies.